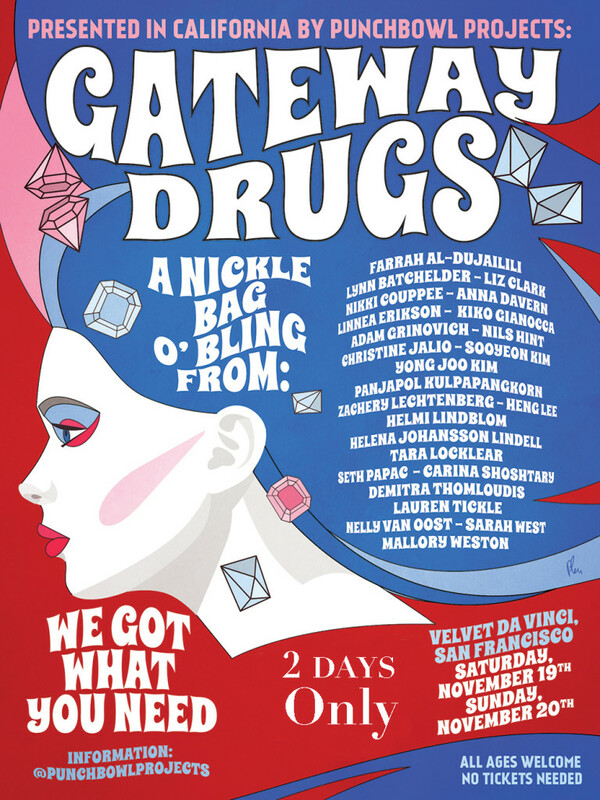 Gateway Drugs Pop-Up Jewelry Event highlights jewelry from 25 international artists and creates a multi-faceted opportunity to introduce a new selection of artist-made, contemporary jewelry. Organized by Mariah Tuttle. Participating artists: Farrah Al-Dujaili (United Kingdom), Lynn Batchelder (USA), LizClark (USA), Nikki Couppee (USA), Anna Davern (Australia), Linnea Erikson (Sweden), Kiko Gianocca (Switzerland), Adam Grinovich (Sweden/USA), Nils Hint (Estonia), Christine Jalio (Finland), Sooyeon Kim (Korea), Yong Joo Kim (Korea), Panjapol Kulpapangkorn (Thailand), Zachery Lechtenberg (USA), Heng Lee (Taiwan), Helmi Lindblom (Finland), Helena Johansson Lindell (Sweden), Tara Locklear (USA), Seth Papac (USA), Carina Shoshtary (Germany), Demitra Thomloudis (USA), Lauren Tickle (USA), Nelly Van Oost (France/Belgium), Sarah West (USA), and Mallory Weston (USA).